In CW’s Jan./Feb. issue, we began a year focused on prayer. Our prayer calendar for the months of September and October can be found on pages 27-28 of the September/October issue, or it is available to download here. Each day has a scripture to direct our thoughts. 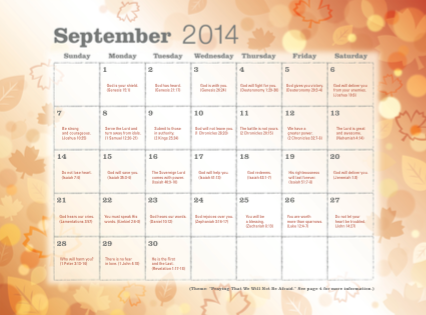 In September we will be focusing on prayers for strength and bravery in our spiritual lives. In October, we will focus on prayers for matters of the heart – peace and joy among them.